In the Japanese saijiki, the word crow (karasu) without further modification is not included, since it is with us noisily all year round. But some compounds have seasonal references. In our area in Western Japan, they come mostly in Autumn to feast on the kaki, the persimmons. They also swoop down in spring, when the yamataroo, a kind of large caterpillar , are descending in the millions to feed on the chestnut leaves, thus themselves becoming a delicious food for the crows. They have an elaborate network in the northern province of Okayama and know exactly where to go on the days people put out the trash in the cities (still mostly open on the curbs...) and when the local delicacies in the fields and woods are ripe. In the big cities, they are quite a nuisance these days, picking at the trash on the curbs and spilling it all over the place while they eat. After them come the stray cats to feed some more, then the rats to finish off the rest. Sometimes there are so many it looks like Hitchkock and the birds around here, whith their eery crooo croo croo. They also fight with our local couple of birds of prey, the tobi 鳶、 and usually a group of them forces the tobi to seek escape by sreweing ever more high into the sky. Quite a sight to see the tobi soaring in speedy retreat. does not seem to be a kigo, as far as I could trace it in the big saijiki. 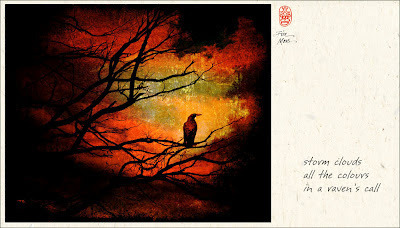 It should not me mixed up with AKI no karasu, crows in autumn, see above. After the A-bomb was dropped on Hiroshima, the crow was associated with ill-fate or bad-fate or bad luck, foreboding future... which may keep "crow" from not being kigo in Japan. 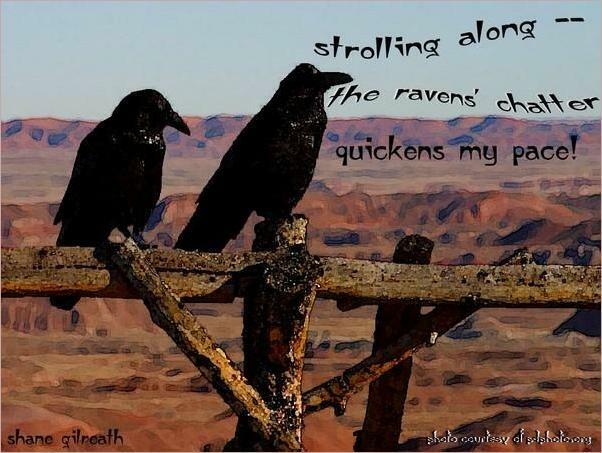 Ravens, rooks, crows, and the like have quite a mythology associated with them in many cultures, some positive, some negative, but almost always powerful. Uzha Jarog Dongchen is highly symbolic of the Bhutanese monarchy. One day, Zhabdrung Ngawang Namgyel dreamt of a raven taking flight from his throne while lending him the power to fly with it. The raven led the Zhabdrung to Pangri Zampa, the seat of Lam Ngawang Chogyel, and entrusted him the place for the establishment of a religious centre. Later, when Zhabdrung Ngawang Namgyel fled to Bhutan at the age of 18, Yeshey Goenpo is said to have offered him the country. Hans Huckebein, a raven who brings a lot of bad luck, is a famous story of Wilhlem Bush, father of the animation. 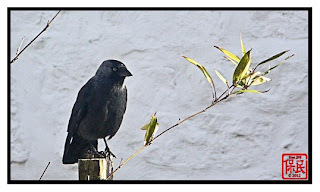 I have often thought that the crow is the bird of the winter -- especially in Ireland. They set out on their daily working routine before I rise -- and in the evening they come home, settle on the branches of a favourite tree or woodland, and tell each other all about it. Very ompanionable. Crows are very much, to me, the sound of childhood, of home, of the open hills of our family farm, of the woodlands in the evening. Intelligent birds. And hard working! The worship of Dewa-san dates from the seventh century, when an imperial prince fled to this area following the death of his father. In a vision, a three-legged crow led him to Haguro-san (Black Wing Mountain), where he lived to the ripe old age of 90, developing his unique blend of Shinto, Buddhism and ancient folk-religion. In Japanese mythology, the Karasu tengu, or minor tengu, is a supernatural being with the head and wings of a black crow. They serve Daitengu, which are fallen yamabushi (monks), tall men with big noses and red faces who can create tornadoes using fans of bird feathers they carry in their sandals. In our neighbourhood, there is a temple, Ryoosan-Ji, where in the night of O-Bon, when the dead souls come back to visit the living, on August 14, at midnight to the light of two torches only, the God of the Raven, karasu no kamisama 烏の神様, invades the mind of a local shaman and the man starts hopping around in the dark like a bird, sometimes for more than two hours. I invite you to come and partake. It is one of the most spoooky matsuri festivals I have seen in Japan. And just three miles from my home. HABITAT: Entirely urban and suburban areas in s Africa, especially industrial sites and informal settlements. GENERAL HABITS: In pairs when br, flocks up to 50 at other times. Aggressively mobs other spp, particularly raptors16. 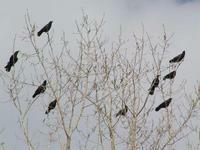 Roosts communally in trees, arriving in flocks of up to 200. Possibly displaced from c Durban, KwaZulu-Natal by Pied Crow, but in Mombasa, Kenya, this situation reversed. Regarded as pest in Durban, where birds take food from children, kill chicks of domestic fowls, and repeatedly dive-bomb any person near the nest. The Swahili word for crow is kunguru, and there are several crow species in coastal Tanzania and Zanzibar. One of them, known in ornithology as Corvus splendens or the "house crow", is referred to in Swahili as the "Indian crow" (kunguru wa walozi). This bird is a cynosure: everybody I spoke with in Dar es Salaam and Stonetown in Zanzibar has crow stories to tell. The bird is ubiquitous in these urban areas and invariably makes a nuisance of itself. My suggestion is simple: in complaining about "Indian house crows" Tanzanians and Zanzibaris are also complaining about Indians. The common crow is widely distributed throughout the continent of North America. It breeds from British Columbia east to New Foundland, and south to southern California, Florida and the Gulf Coast. It winters north as far as southern Canada. 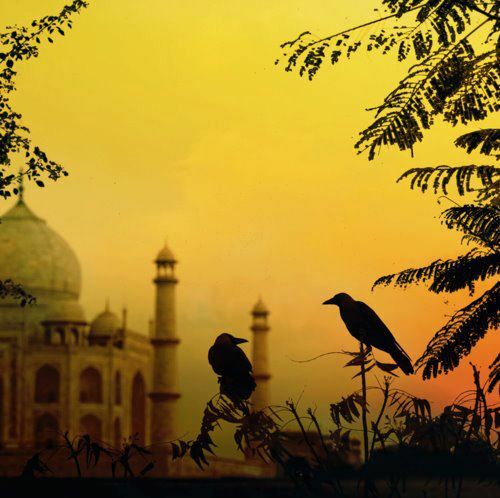 The common crow is a partial migrant but a permanent resident in some areas. The common crow is charcoal black in color. It is approximately 17-21 inches in length. Two other very common species within the Corvidae family are the fish crow and the raven. The fish crow tends to be smaller than the common crow (17 inches) while the raven tends to be larger (20-27 inches). A fan shaped tail characterizes the common crow whereas the raven has a wedged shaped tail. Another feature of the common crow is its steady flapping flight, which is different from the soaring. Another difference between the crow and the raven is their calls. The common crow's call is a "caw-caw" or "caa-caa" sound, while the common raven's call is a varied, deep, guttural croaking, "wonk-wonk". The fish crow call is also unlike that of the common crow, either a nasal "kwak" or a nasal two noted "ah-ah." The common crow is a very intelligent and adaptable creature. In a word one could describe them as opportunistic. Recent studies by ornithologists show that crows and ravens are among the most intelligent birds, along with other members of the Corvidae. 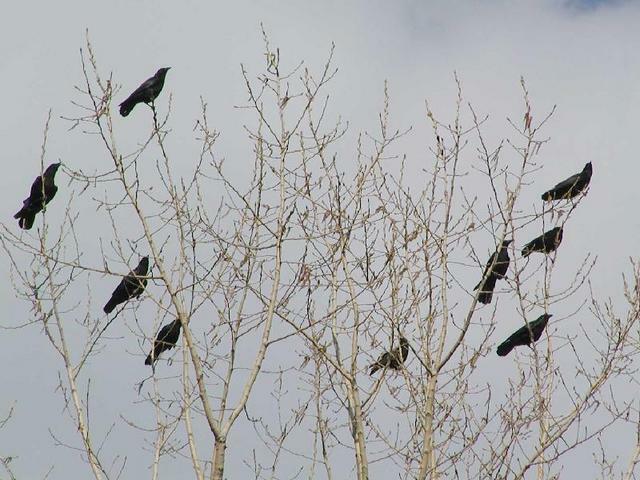 Crows gather in groups from two to eight birds in the summer, while during the winter they gather from many miles in great nocturnal roosts of up to thousands of birds. During the day they fly up to fifty miles away from these roosts in search of food. During feeding, one of two crows can be seen on high perched places serving as a lookout for the rest of the flock. These sentinels watch for signs of danger and warn the rest of the flock. This behavior allows the rest of the flock to forage more efficiently. 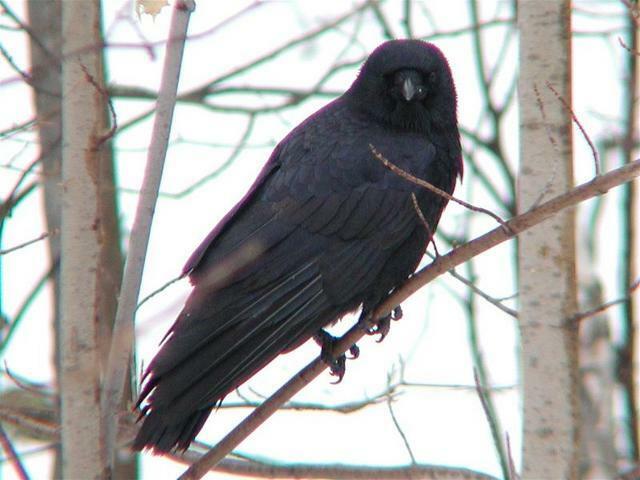 The crow's call has varations that allow it to express warning, threats, taunting, and cheer. sometimes known as the Eurasian Jackdaw, European Jackdaw or simply Jackdaw, is a passerine bird in the crow family. Found across Europe, western Asia and North Africa, it is mostly resident, although northern and eastern populations migrate south in winter. picking herbs and a quarrel.. In olden times, the gods Onamuchi-no-Kami 大己貴命 and Sukunahikona-no-Kami 少彦名命descended to earth one day and saw three injured crows bathing in a puddle.
. Arima Tosen Shrine 有馬 湯泉神社 Toosen Jinja . For centuries the corvids, ravens and crows in particular (corvus corax is the Latin name for the common raven and corvus corone for the carrion and hooded crows), have had a special place in the mythology of various cultures. In modern times this fascination has barely diminished. From Edgar Allen Poe's literary classic to the film of James O'Barr's cult graphic novel "The Crow", these birds still exert a powerful hold over the psyche of a significant fraction of the population. The Goths who paint their faces with white make-up and the weekend warriors who expect Raven to take them to the Otherworld to meet the dead do not see the same animal as the farmers who set up decoys in order to shoot large numbers of them every year in late spring. This is, however, typical of a creature that presents a paradox wherever one looks. Famous Native American Creative Trickster God, known by many tribes under many names. There is more to RAVEN than meets the eye. And how many of you have met the eye of a raven? They've always been associated with Godliness. Few people know that the first bird out of Noah's ark was a raven. It just didn't return. It didn't feel the need. ODIN relied on his two ravens to fly round the world every day and keep him informed. Edgar Allan Poe's raven shrieked 'Nevermore' but what that has to do with anything only Poe knows. In the beginning, RAVEN was first and foremost a Creator and Trickster God - especially of the Haida tribe who, claim he discovered the first humans hiding in a clam shell and brought them berries and salmon. A bit of a tricky God himself, he's also the long-suffering victim of arch-rival in trickery, COYOTE. His brother LOGOBOLA is also a bit of a tricky customer, but, despite what you may have heard, absolutely no frogs are involved. Stories about him abound. few of them would be clever enough to be crows. 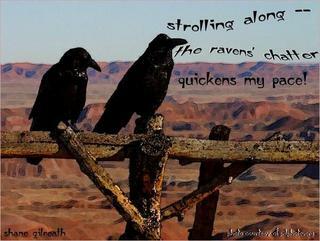 .. .. .. Edgar Allen Poe "The Raven." *the river rook, a cousin of the crow, has been known to crack open clams with river pebbles or small rocks by dropping them on the clam... it it tool use? some argue that it is a sign of intelligence?! > > a curious blossom. > > lords of the winter. as if it were tilling the field. David Lanoue has 69 haiku about the crow by Issa. Use this link and input " karasu "
Read more about Basho and some Crow Haiku.
. higoro nikuki karasu mo yuki no ashita kana . autumn dusk . . . In most lakes, rivers and sweet waters of Japan. The outside is black and reminds of a crow. .. .. .. .. .. So light, yet oddly dazing! Thank you Gabi San for including my humble Haiku and Photo here. I am honoured. I should add that the Jackdaw is a superb mimic. At my old cottage in the country I had a family of Jackdaws living in my chimney. It was a huge old chimney, the sort where they smoked hams and bacon. The jackdaws learned to mimic my telephone ringing. When I changed to a pulse phone, the jackdaws changed their call within a week. 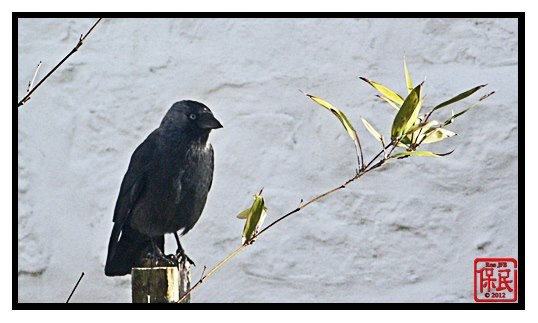 The times I ran indoors to answer the phone when it was really the mischievous jackdaw on my roof calling! And I swear he was laughing!! A wonderful poem embedded in a compilation of polite standard phrases, which even a poetic genius like Matsuo Bashō was using. Bashō seems slightly embarrassed when he writes that he was sorry to have nothing special to pass on. So beautiful in morning snow. I wrote this! - When you have time, please visit me and stay for the night. Let's talk together. I will be waiting for you with Yusui*. Although it is not as good if there were only you and me. Sorry to have nothing special to pass on this time. That's all. – The 12th day of the 9th (lunar) month – PS I am greatly looking forward to your visit." The poem was composed in 1691, at Gichu-ji, a Tendai temple in Otsu where Basho often stayed in a cottage called Mumyō-an, "Nameless Hut". Bashō was later buried in Gichu-ji temple (see image). *Yusui, mentioned in the letter, is Mizuta Masahide (1657-1723), a medical doctor and Samurai. As a poet he was a follower of Bashō. Masahide was the head of a group of poets who built (paid for) the Mumyo-an. sakaidori 境鳥（さかいどり）"Bird at the Border"
Aotengu 青天狗 Ao-Tengu "Green / Blue Tengu"